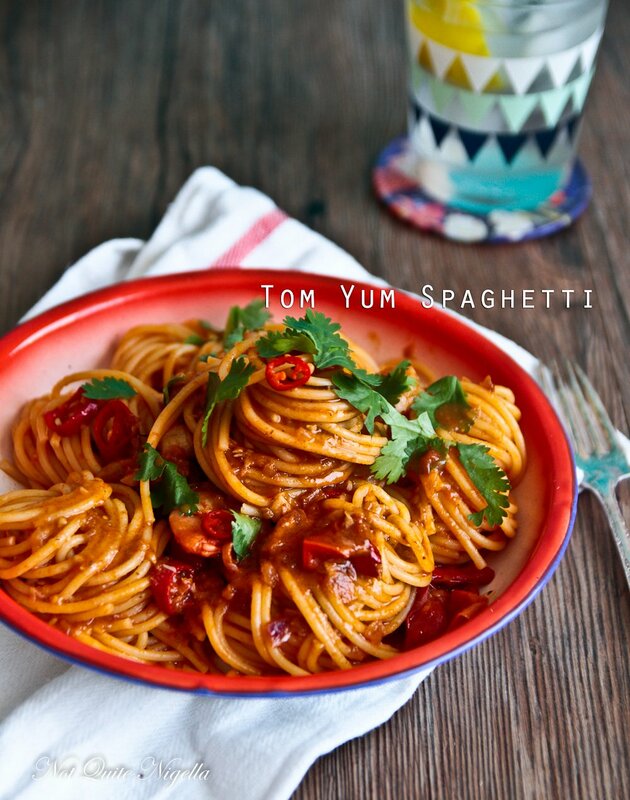 Tom Yum Spaghetti - Crazy but Delicious! This cross cultural mix of Thai flavours and Italian spaghetti is not as alarming as it sounds. In fact, it's one of the most delicious and flavoursome recipes we have eaten recently. 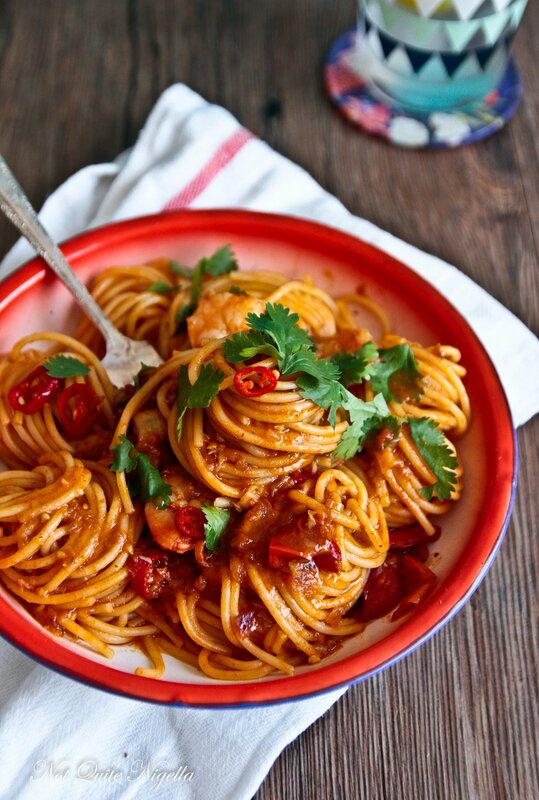 Spaghetti which is really not that different to noodles is flavoured with a spicy, sweet, tangy and savoury sauce from tum yum paste and tender prawns finish off this toothsome dish. Our friend The Wizard is perhaps one of the most popular men I have ever met with women. He has some sort of effect on them so normal women absolutely swoon around him. When we started playing with his Tinder, it went off like a blitzkreig every few seconds or so with matches and when I've tried to get him together with my single friends they've given me a resounding, "You must introduce me to him" sort of response. He has become so expert with Tinder that his bio reads "High functioning alcoholic" and lists his height which is 6 foot 2 inches. He said that height was the number 1 question asked of him and so he put it up because he was sick of answering the question. Which meant that naughty Mr NQN got an idea when he took over his phone. He switched out "high functioning alcoholic" to "*semi *functioning alcoholic" and changed his height from 6 foot 2 inches to 5 foot 2 inches. Within a few hours a woman that he was seeing had politely inquired about his height. He knew straight away that it was Mr NQN who had change it because he is a known trickster so he changed it back but it wasn't for a month or two that he realised that his status as an alcoholic had been changed from high functioning to semi functioning. Apparently nobody had ever asked and it wasn't a problem with the ladies as much as his lower height was! The upshot is: semi alcoholism=ok, short=not ok! But sometimes it's totally ok to change things and people won't mind, they may even embrace it. Take this spaghetti for one. I first saw the idea for this on Yen's blog and I was immediately curious. 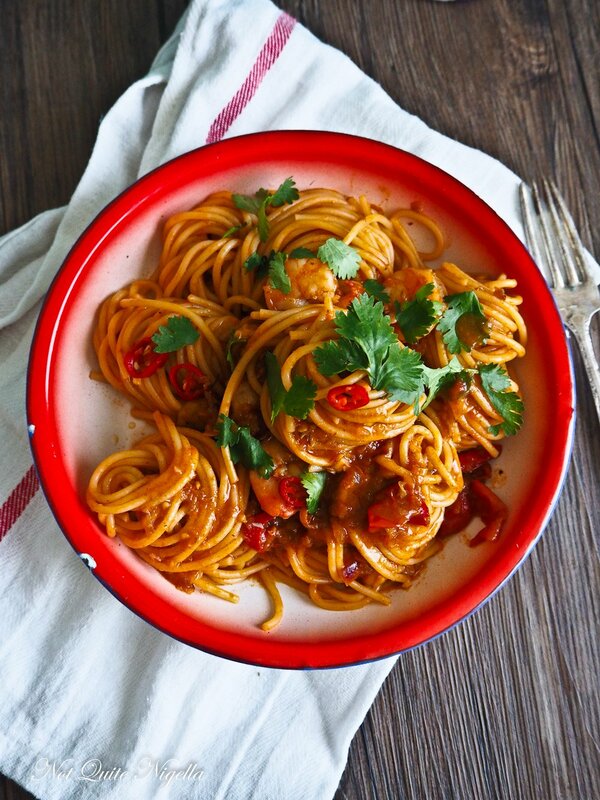 Combining Thai flavours with spaghetti? Would it work? Or would it be one of those things that you might live to regret? They sometimes say that when fusion goes bad it turns into confusion. Well let me assure you that this is 100% delicious. Even more really - try 1000%! Once you try it, the cross cultural status of this dish will matter not a jot. I mean spaghetti isn't really that different from noodles if you think about it. And this dish with its hot, sour and spicy qualities imbues the pasta with such a delectable sauce that you may find yourself making it again the next night (yes that was us). So tell me Dear Reader, what would turn you off in someone's Tinder description? And do you go for fusion dishes? Which two cuisines go well together in your experience? Step 1 - Cook the spaghetti in plenty of salted, boiling water. *Step 2 - *Meanwhile, while it is cooking, prep the ingredients. Start cooking the onion and garlic in a medium hot pan with some oil. Add the tom yum paste, lemongrass, kaffir lime leaves and chillies and cook for a couple of minutes until fragrant. Add the cherry tomatoes (I put them in whole but I'd suggest halving them for quicker cooking), mushrooms and tomato paste. 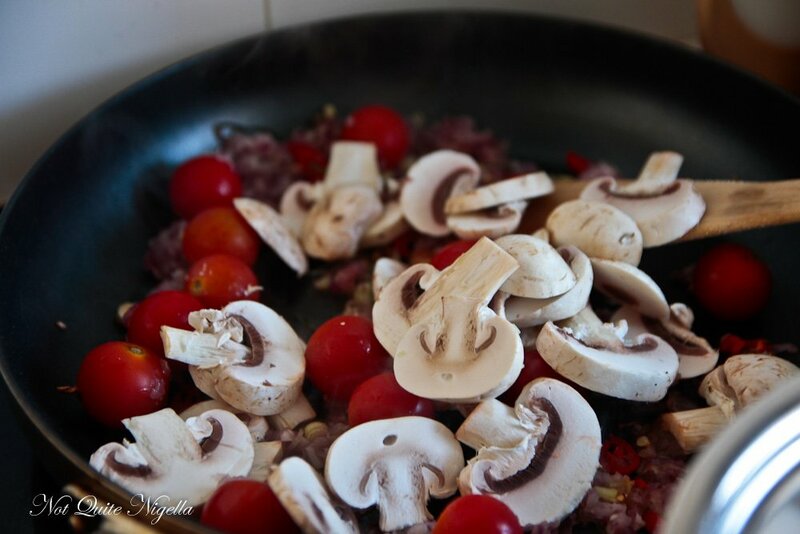 Fry until the tomatoes make a thick sauce with the mushrooms and paste. Step 3 - Reserve 2 cups of pasta cooking water and drain the spaghetti of the rest of the water. 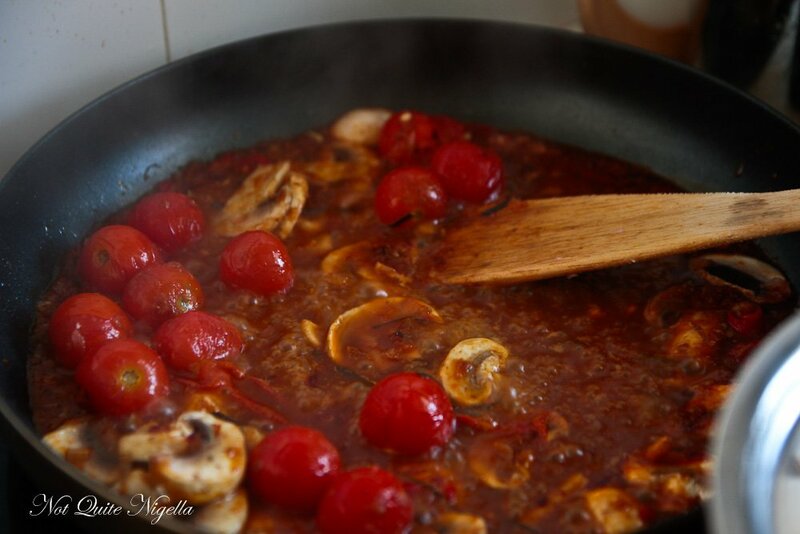 Add one cup of the pasta water to the sauce and keep cooking it - it will thicken up. Add the lime juice and fish sauce and taste - if it needs more salt add more fish sauce, if it needs more tang add more lime juice (it's meant to be hot and sour). Mine needed more chilli so I added another. Step 4 - Add the prawns and cook until they turn pink - do not overcook prawns as they will become rubbery (about a minute will do until they just turn pink). Add the pasta to the sauce and coat well. Add more of the pasta water to create more of a sauce. Serve with chopped coriander on top. recipeA Spaghetti & Pizza Party! recipeCreamy Cacio e Pepe Spaghetti - Four Ingredients, 15 Minutes!